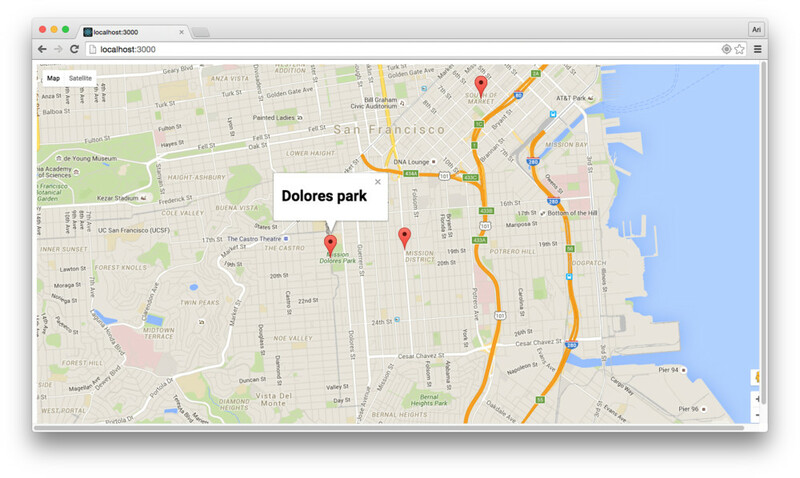 In this tutorial, we'll walk through how to build a React component that uses the Google Maps API. Integrating React with external libraries like Google or Facebook APIs can be confusing and challenging. 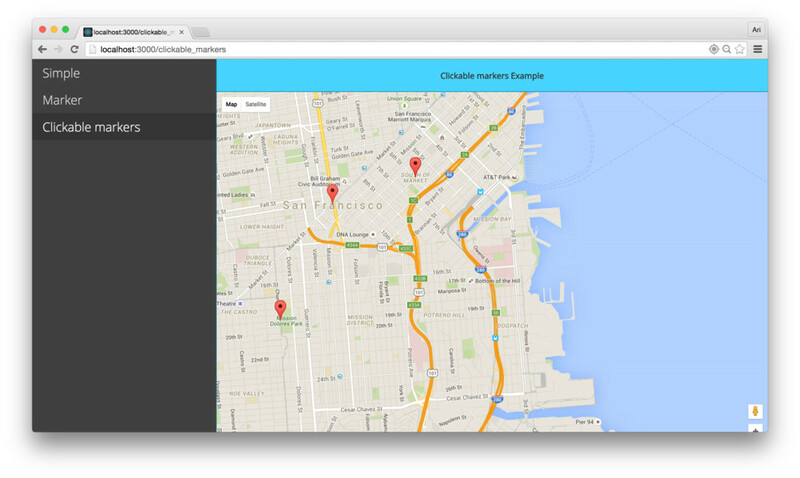 In this discussion, we&apos;ll look at how to integrate the Google Maps API with React. In this post we&apos;ll deal with lazily-loading the library through building complex nested components. This post is not only about how to use Google Maps, but how to use 3rd party libraries in React generally and how to build up rich interactive components. In this post, we&apos;ll look at how we to connect the Google API and build a Google Maps Component. Before we can integrate with Google Maps, we&apos;ll need to sign up at Google to get an API key. You&apos;re more than welcome to use our apiKey, but please use it lightly so Google doesn&apos;t cut off our api access so it works for everyone. Handling access to the Google API within our components. Our goal here is to create an independent component that can handle these two tasks for us. Let&apos;s build a GoogleApiComponent to handle taking care of this for us (alternatively, we&apos;ve wrapped this into an npm module ( google-maps-react). Feel free to grab this npm module and head to the next section). First, grab the ScriptCache.js script from this gist. GoogleApi.js is a script tag compiler. Essentially, this utility module builds a Google Script tag link allowing us to describe the pieces of the Google API we want to load in using a JS object and letting it build the endpoint string. GoogleApiComponent.js - The React wrapper which is responsible for loading a component and passing through the window.google object after it&apos;s loaded on the page. The bulk of the work with the code is wrapped away in the GoogleApiComponent component. It&apos;s responsible for passing through a loaded prop that is set to true after the Google API has been loaded. Once it&apos;s loaded, the prop will be flipped to true and our default render function will render the <div>. With the stage set for our Container component, let&apos;s start our Map component. 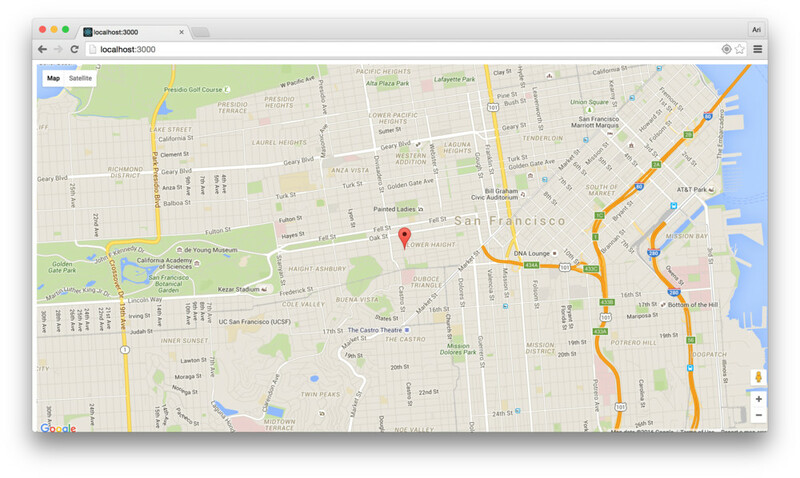 Our Map component is essentially a simple wrapper around the default Google Maps api. The tricky part about using the asynchronous library is being able to depend upon it&apos;s API being available. When our GoogleApiComponent loads on the page, it will create a google map component and pass it into our Map component as a prop. As we&apos;re wrapping our main component inside the Google api component wrapper, we can check for either a new prop or the mounting of the component (we&apos;ll need to handle both) to see if/when we get a link to the window.google library as it&apos;s been loaded on the page. Let&apos;s update our Map component to include the case when the map is first loaded. When the Map component is first loaded, we cannot depend upon the google api being available, so we&apos;ll need to check if it&apos;s loaded. If our component is rendered without it, the google prop will be undefined and when it&apos;s loaded, it will be defined. After a React component has updated, the componentDidUpdate() method will be run. Since our component is based upon Google&apos;s api, which is outside of the React component workflow, we can use the componentDidUpdate() method as a way to be confident our component has changed and let the map update along with the rest of the component. In our Map component, let&apos;s handle the case when the Map is available when the component mounts. This would happen on the page whenever the map has already been loaded previously in our app. For instance, the user navigated to a page with a Map component already available. 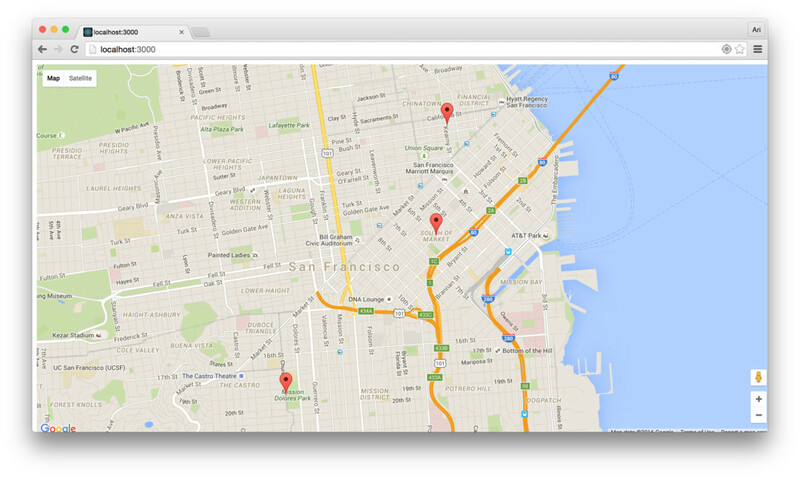 To instantiate a Google map object on our page, we&apos;ll use the map API (documentation is here) as usual. zoom - the level of zoom to display, i.e. how close to the center we should display. Above, we statically assigned the zoom and center (we&apos;ll move these to be dynamic shortly). Once we reload the page, we&apos;ll see that we now should have a map loaded in our page. Defining propTypes on a component is always good practice to both document our components and make them more easily sharable. For more information on documenting propTypes, the React documentation is a convincing place to read more. Since we&apos;ll be moving the map around and we&apos;ll want the map to retain state, we can move this to be held in local state of the map. Moving the location to state will also have the side-effect of making working with the navigator object simple. Wouldn&apos;t it be more exciting if we could use the browser&apos;s technology to determine the current location of the viewer instead of hardcoding the lat and lng props? Awesome. We&apos;ll be using the navigator from the native browser implementation. We&apos;ll need to be sure that the browser our user is using supports the navigator property, so keeping that idea in mind, we can call on the Navigator object to get us the current location of the user and update the state of our component to use this position object. Additionally, let&apos;s only set the map to use the current location if we set a boolean prop to true. It would be weird to use a <Map /> component with a center set to the current location when we want to show a specific address. Now when the map is mounted, the center will be updated... except, there&apos;s one problem: the map won&apos;t be repositioned to the new location. The state will be updated, but the center won&apos;t change. Let&apos;s fix this by checking for an update to the currentLocation in the state after the component itself is updated. We already have a componentDidUpdate() method defined, so let&apos;s use this spot to recenter the map if the location changes. Since we have our Map component set, the we can interact with it in a lot of ways. The google map api is rich with opportunities for handling events that happen within the map (just check out the extensive documentation). We can set up callbacks to call when these events occur within the map instance itself. For instance, when the google map has been moved or dragged around, we can fire a callback. For instance, let&apos;s set up a callback to run when the map itself has been dragged around. To add event handlers, we need the map to be listening for events. We can add listeners pretty easily with the Google API using the addListener() function on our Map. After we create our map, in the loadMap() function, we can add our event listeners. Let&apos;s handle the dragend event that will be fired when the user is done moving the map to a new location. When our user is done moving around the map, the dragend event will be fired and we&apos;ll call our onMove() function we passed in with the props. One issue with the way we&apos;re handling callbacks now is that the dragend event is fired a LOT of times. We don&apos;t necessarily need it to be called every single time it&apos;s dragged around, but at least once at the end. We can create a limit to the amount of times we&apos;ll call the onMove() prop method by setting up a simple timeout that we can clear when the event is fired again. Although we are only handling the dragend event above, we can handle other events as well in a similar fashion, but this can get really cumbersome, really fast. We can be a little bit more clever and more programatic about building our interactivity into our component. Let&apos;s say we want to handle two events, the dragend event and the click event. Rather than copy+pasting our code from above for every single event, let&apos;s build this up programmatically. We&apos;ll basically copy+paste our timeout functionality into our new handleEvent() function. Now, any time we pass a prop with the event name, like click it will get called whenever we click on the map itself. This isn&apos;t very React-like, or JS-like for that matter. Since it&apos;s a callback, a better naming scheme would be onClick and onDragend. Since we&apos;re going meta in the first place, let&apos;s make our propName be a camelized word starting with on and ending with the capitalized event name. We can also fire our own custom events along with the google map instance. Allowing us to listen for our own custom events is an incredibly useful feature that gives us the ability to react to custom functionality using the same event handling mechanism we just set up. An example of this is giving the our <Map /> callback to trigger a ready event. To trigger an event, like the ready event we can use the google.maps.event object&apos;s trigger() function. For handling the case after the map is ready (at the end of our loadMap() function), we can call the trigger() function on the map instance with the event name. Since we&apos;ve already set the rest of the event handlers up, this will just work. What good is a Google Map without markers indicating location spots on the map, eh? Let&apos;s add a method for our users to place a marker on our map. We could set up our Map component to accept a list of places and be responsible for setting up the markers itself, or we can build the Map component in the React Way and build custom components to manipulate the calendar as children. Let&apos;s build a MarkerComponent using the React Way. As we previously did, let&apos;s build the usage first and then build the implementation. The React Way is to write our Marker components as children of the Map component. We&apos;ll build our <Marker /> component as a child of the Map component so that they are independent of the Map itself, but still can be interdependent upon the Map component being available. When we place a <Marker /> inside the <Map /> component, we&apos;ll want to pass through some custom props that the Map contains, including the map instance object to it&apos;s children. Now, when our <Map /> component is rendered, it will not only place the Map on the page, but it will also call the lifecycle methods for it&apos;s children. Of course, we actually haven&apos;t placed any children in the map yet. The renderChildren() method will be responsible for actually calling the methods on the children, so in here is where we&apos;ll create clones/copies of the children to display in the map. To add props to a child inside a component, we&apos;ll use the React.cloneElement() method. This method accepts an element and creates a copy, giving us the opportunity to append props and/or children to the child. We&apos;ll use the cloneElement() to append the map instance, as well as the google prop. Additionally, let&apos;s add the map center as well, so we can set the mapCenter as the default position of a marker. Now, if we use the Map without children, the renderChildren() method won&apos;t blow up the rest of the component. Moving on, we&apos;ll want to clone each of the children passed through. In other words, we&apos;ll want to map through each of the children and run the React.cloneElement() function on each. React gives us the React.Children.map() to run over each of the children passed by a component and run a function on... sounds suspiciously like what we need to do, ey? The Marker component is similar to the Map component in that it&apos;s a wrapper around the google api, so we&apos;ll take the same strategy where we will update the raw JS object after the component itself has been updated (via props or state). Although we&apos;ll write a component that hands the constructed virtual DOM back to React, we won&apos;t need to interact with the DOM element, so we can return null from our render method (to prevent it from flowing into the view). While we are at it, let&apos;s also define our propTypes for our Marker component. We&apos;ll need to define a position at minimum. With our propTypes set, let&apos;s get started wrapping our new component with the google.maps.Marker() object. As we did with our previous Map component, we&apos;ll interact with the component after it&apos;s props have been updated. After reloading our page, we&apos;ll see we have a few markers on the map. Markers aren&apos;t too interesting without interactivity. Let&apos;s add some to our markers. We can handle adding interactivity to our <Marker /> component in the exact same way as we did with our <Map /> component. When we&apos;re done with the markers, it&apos;s useful to remove them from the map. Since React is taking care of the state tree, we can just ask the google API to remove the marker for us using the setMap(null) function on the <Marker /> instance. From here, we can use the marker as a point of reference for our user to click on to get more information about each of the markers. In the Google API, the window that pops up over each of the markers is called an InfoWindow. To create an InfoWindow, we must pass in a string of html to show. Since the InfoWindow itself isn&apos;t a React component, we&apos;ll need to handle the conversion from a React component to html. First, let&apos;s look at the usage of a ne InfoWindow component. In our Container.render() function, let&apos;s add a reference to the new component we&apos;ll create. The InfoWindow Google instance will require a marker to determine where to place the element, we&apos;ll need to pass one in. We&apos;ll also programmatically handle showing/hiding the InfoWindow component so we can operate with it in the React Way. Let&apos;s start our our InfoWindow component as usual. It will be similar to the Marker component in that we&apos;re not going to use the virtual dom component it creates. Just like our <Marker /> component, our <InfoWindow /> component will mirror the state of the Google map instance by updating itself along with the updates of of the map. Thus, we&apos;ll update this component using the componentDidUpdate() lifecycle function. If the content of the InfoWindow has been updated so we can update it live. We need to check to see if the state of the visibility of the InfoWindow has changed. Let&apos;s handle each one at a time. We&apos;re keeping a reference to the this.infowindow with a const iw in the componentDidUpdate() function. We&apos;ll come back to using this instance shortly. Finally, if the content of the InfoWindow has been updated and the visibility has not been updated, then we can update the content of the infowindow. The infowindow requires us to set content for us to show in the browser. Previously, we set the content to an empty string. When we want to show the window, the empty string isn&apos;t going to be very interesting. We&apos;ll use the children of the <InfoWindow /> component to define what the instance should show. As we previously discussed, we&apos;ll need to translate the React component into an HTML string that the InfoWindow instance knows how to handle. We can use the ReactDOMServer from react-dom to update the content. If the visible prop has changed, we&apos;ll want to show or hide the InfoWindow component. Since this requires a programatic update, we&apos;ll need to check the value of the prop and open the window if it&apos;s visible or close it if it&apos;s not available. As we&apos;re checking against the previous props, we know that the infoWindow is closed if the visible prop is true and visa versa. Lastly, the state of the InfoWindow this.state.showingInfoWindow will never be reset to false unless we know when the instance is closed (it will also always be open after the first time we open it). We&apos;ll need a way for the <InfoWindow /> component to communicate back with it&apos;s parent that the InfoWindow has been closed (either through clicking the x at the top of the window OR by clicking on the <Map />). Now, if we click on the <Map /> instance, the state of the Container will update the showingInfoWindow and our <InfoWindow /> instance visibility will be reflected accordingly. Finally, we&apos;ll need to add a callback to the infoWindow to be called when the infowindow is opened as well as when it&apos;s closed (although for now, we&apos;ll only use the callback when it&apos;s closed). To add the callback, we&apos;ll need to hook into the state of the infowindow instance. As we built our Google Map component, we&apos;ve walked through a lot of complex interactions from parent to children components, interacting with an outside library, keeping the state of a native JS library in line with a component, and much more. The entire module is available at npm google-maps-react. Feel free to check it out, pull the source, contribute back.